At the gateway to the Okanagan and Similkameen Valley lies Canada’s only desert, and the delightful lakeside town of Osoyoos. Osoyoos is location at the junction of two major highways (Highway 97 and Highway 3) at the southern tip of the Okanagan Valley. 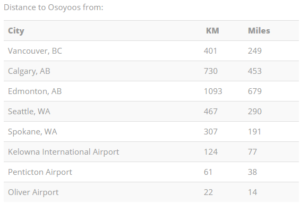 Osoyoos transportation options range from local bus routes to international airports, all within 124 KM (77 M). Osoyoos is only 3 kilometres away from the Canada – U.S. border, and shares Osoyoos Lake with Washington State. Osoyoos is within close proximity to two major airports connecting national and international flights, as well as one local airport available to private aircraft. BC Transit provides bus service locally as well as service throughout the South Okanagan, connecting Osoyoos with Oliver, Penticton, Kelowna, and other townships. You can also visit explorebcbybus.com to find routes across British Columbia. This 2477 ft runway is conveniently located on Highway 3, across from the Industrial Park. The runway parallels Highway 3 and the Buena Vista Industrial Park in Osoyoos, just west of the intersection of Highway 3 and 97. The airport is currently under expansion and large scale improvements to better serve the local community. 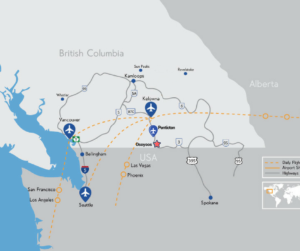 The Penticton regional airport is located 57 km North of Osoyoos, and provides daily connecting flights to the Vancouver International Airport and Calgary International Airport. The Kelowna International airport is located 147 km North of Osoyoos and operates scheduled air service to the major hub airports of Vancouver, Toronto, Calgary, Edmonton, Victoria, and Seattle, as well as less frequent seasonal service to Cancún, Puerto Vallarta, Los Cabos, and Phoenix. Click here for a full listing of local businesses in Osoyoos.